I love peaches, and I've come to terms with the above statement--I always have a napkin or twelve (or better yet, a wet rag) at the ready. Since our tomatoes are coming in at a good pace (knock on wood), I was able to recreate one of my favorite salsas, Newman's Own Peach Salsa. It's sweet and spicy, and I often find myself using my finger a chip to fish out the chunks of peach scattered throughout the jar. I guess we haven't quite hit primo peach season here (the ones I got at the store last week are still sitting unripened in the fruit bowl), but they were fine for this salsa (my go-to recipe with two peeled, pitted, and chopped peaches thrown in). It was the perfect selection to spruce up baked chicken breasts, which I later turned into a batch of chicken enchiladas using the method described here. This dish has it all--sweet, sour, salty, spicy, and tangy, all at once. Whether you eat the breasts whole or shred them up for enchiladas, I daresay it's another winner winner chicken dinner! Speaking of winners, don't forget to enter my TOUCH brewer giveaway. It really is an awesome prize! Preheat oven to 375 degrees F and lightly grease a 13x9-inch baking dish. Sprinkle taco seasoning on both sides of chicken breasts (you can dump the seasoning and chicken into a bag for a more thorough coating, if you want). Place the chicken into the prepared dish. In a bowl, combine the salsa, brown sugar, vinegar, and mustard and pour over the chicken. 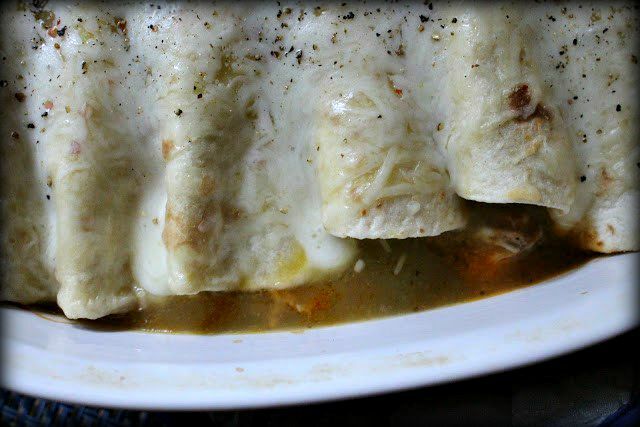 Bake for 25-35 minutes (less for tenderloins), or until the internal temperature is 160 degrees F.
Shred for use in enchiladas, if desired! That looks delicious! A great dish. And peaches from you, too! YUM. 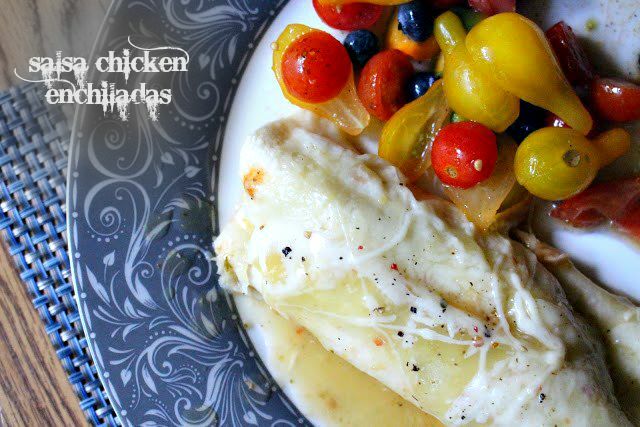 I've never thought of having fruit salsa with enchiladas, but I love the sweet-savory combo in general so this would be perfect in the summer! We love peaches! This looks so delicious. I'm pretty sure my peach tree came down about 10 years ago, but I have 3 plum trees that are laden with fruit this year. Sadly, plums are tiny by comparison to peaches, but so similar in flavor and juiciness! Your salsa sounds great, if the fruits would ever last long enough to become something other than snacks hereabouts. Totally agree with you on peaches. I usually slice it in half, get the pit out and then bite into it. The overload of sweetness is awesome! This recipe seems like a healthy way to enjoy fruit, but still get full from the chicken. Driving through Georgia years ago we bought a sack of peaches and ate them as we drove. Peach juice everywhere! What a mess! But worth every mouthful. Love the peach salsa idea with chicken. Looks great. Things are still kinda hectic around here, Grace but, I have managed to down a few juicy peaches with and without napkins. Peach Salsa Chicken sounds absoultely amazing!!! I may need to save this recipe. I'm sure it's a whole lot "neater." Thanks for sharing, Grace. This looks delicious! It's peach season here, I love the peach salsa idea! I've never tried a commercial brand salsa. Only locally made one when we visited, I think it was Gafney, SC. I fell in love with it! But, now you have me craving, so I will have to try Newmans Own! And, I'll more than likely try it in your dish, because it sounds like a little bit of Carolina goodness! The most impressive about this salsa is its colors! So beautiful! I love adding fruit salsas to savory foods! These enchiladas are the perfect way to pregame for peach season. Hi Grace, so clever to make a peach salsa, I bet it was perfect with the chicken enchiladas. Looks delicious! I love peaches Grace and this look delicious! I actually canned peach salsa a couple years ago. Mmmmm!